Hello death-by-chocolate. This may replace “Phil” in my recipe box as my go-to chocoholic cookie. I may even make this my new “Phil” as it’s essentially the same idea. Chocolate cookies with chocolate chips in them. But these are made with butter, chocolate and more chocolate. The previous “Phils”, while delicious, were packed with shortening. I think butter is just better. 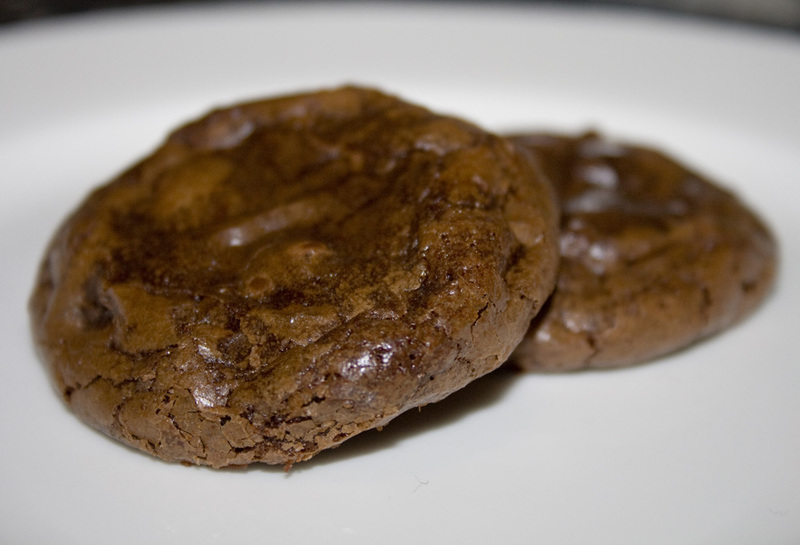 Really, these are more like a brownie than a cookie. So rich and delicious. The edges get nice and crinkly while the center stays a little bit fudgey and gooey. These cookies turn out just about a perfect two-bite size, which is good. They are so incredibly decadent – two bites may be all you can handle. It is very important that you chill this dough completely before attempting to roll it into balls. Before going into the fridge the dough is totally unmanageable…if you try to roll it into dough balls before chilling – you’ll end up with a gooey chocolate mess! It firms up perfectly though. Remember, patience is a virtue! While waiting, no matter how much you just want to spoon the dough out of the bowl and eat it all up, resist the temptation. In the microwave or in a double boiler, melt unsweetened chocolate, 1 cup of the chocolate chips, and the butter stirring occasionally until smooth. Remove from heat and set aside to cool. In a large bowl, whip eggs and sugar until thick and pale, about 2 minutes. Stir in the vanilla and the chocolate mixture until well mixed. Combine the flour, cocoa, baking powder and salt; gradually stir into the chocolate mixture. Fold in remaining 1 cup chocolate chips. Cover dough and chill for at least an hour or overnight. Preheat oven to 350 degrees F (175 degrees C). Using a small melon baller and slightly damp hands, roll chilled dough into 1 inch balls. Place on ungreased cookie sheets so they are 2 inches apart. Bake for 9 to 11 minutes in the preheated oven. Don’t overbake! They should come out of the oven when puffed and the tops are just starting to crack. Allow cookies to cool on baking sheet for 5 minutes before removing to a wire rack to cool completely.